There are always new stars on the fashion scene, so I had to change the label of this series. I will add new articles to it as I see others. I have been holding off writing on Abol as she always seemed to have something new and exciting coming up - each deserved its own moment in the spotlight - but today is the day. The difficulty here will be what to share as we just released a full article in Fame'd Magazine in February 2012 - Bringing Art to Fashion - so I want to offer something with hopefully a different angle. One of the privileges of being able to attend shows at local fashion weeks is the chance to be surprised by new designers you have never heard of. Some are established, others are brand new on the scene. At Eco Fashion Week in October 2012, I was delighted to see the first collection by Hamideh Abol. Shown under the original Shefelt label, it was wearable textile art at it's best. Wool felting done by hand was combined with soft, sheer chiffons and thoughtfully tinted with natural dyes. I particularly loved the garments I label hard and soft. They had the structured, textural wool felting balanced against yards of chiffon that floated gracefully as models walked the runway. It was magical - like a fairy in the forest. There were also several dresses constructed with more focus on the beautiful, textural felting that also took my breath away such as the one on the right. It was unexpected, and when I'm watching 4-5 shows a day that's always good. I tucked her name into my files. While I personally love this direction in clothing, the final decision on who is featured in Fame'd is not mine and in general the magazine has rarely covered textile artists. Would it get approved if submitted? Would someone want to shoot it? I didn't know. Getting the media's attention sometimes takes a special touch and this is another example on how a designer handled it effectively. Abol emailed a short time after the show asking for feedback in several areas. I was both impressed and charmed. It began a chain of events that lead to the artist being featured in Fame'd. There is no one path to follow, and it always involves a little luck, but catching someone's attention in an effective way is always the first step. You also have to be ready for the attention - i's dotted, t's crossed, collection polished and edited to a professional level. Abol was ready. 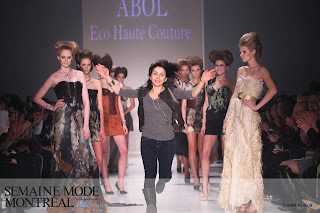 Next I find that Abol is off to Montreal Fashion Week. I was intrigued, and as luck would have it, was attending this season for the first time. Then the draft of her article came in for editing and it filled in the blanks. She always loved the arts and had been exposed through fellow students at Emily Carr to wool felting. The designer just recently chose to walk away from her "other" career and a steady paycheck to focus on art - a passion that could no longer be denied. When you add it all up all the small steps along the way you find examples of strength, courage, focus, drive and commitment. Artists need each of those traits to succeed and Abol seems to have them all. I was proud to be there in the front row in Montreal to see this show. It was the only offering from a designer outside of Quebec except for the students in the Telio Design Competition and she did Vancouver proud. 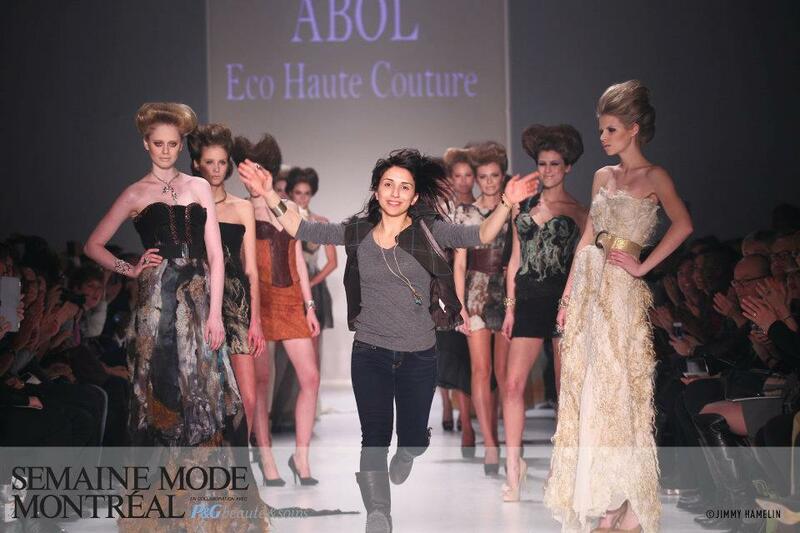 Abol sprinted down the runway in sheer excitement at the end of her show. If she could have flown, she would have. The challenge for this talented artist now is how to tame this whirlwind of attention into a steady and focused breeze that will move her further along. Textile artists who produce unique and amazing one-of-a-kind pieces can have a larger challenge. You need a clientele that truly understands they are wearing art to support your direction. I personally wish Hamideh Abol great success and look forward to watching her evolve as an artist. This is only the beginning. For more information on Abol go to www.AbolDesign.com.